Under a broadest reasonable interpretation, words of the claim must be given their plain meaning, unless such meaning is inconsistent with the specification. The plain meaning of a term means the ordinary and customary meaning given to the term by those of ordinary skill in the art at the time of the invention. The ordinary and customary meaning of a term may be evidenced by a variety of sources, including the words of the claims themselves, the specification, drawings, and prior art. However, the best source for determining the meaning of a claim term is the specification - the greatest clarity is obtained when the specification serves as a glossary for the claim terms. The words of the claim must be given their plain meaning unless the plain meaning is inconsistent with the specification. In re Zletz, 893 F.2d 319, 321, 13 USPQ2d 1320, 1322 (Fed. Cir. 1989) (discussed below); Chef America, Inc. v. Lamb-Weston, Inc., 358 F.3d 1371, 1372, 69 USPQ2d 1857 (Fed. Cir. 2004) (Ordinary, simple English words whose meaning is clear and unquestionable, absent any indication that their use in a particular context changes their meaning, are construed to mean exactly what they say. Thus, "heating the resulting batter-coated dough to a temperature in the range of about 400oF to 850oF" required heating the dough, rather than the air inside an oven, to the specified temperature.). The presumption that a term is given its ordinary and customary meaning may be rebutted by the applicant by clearly setting forth a different definition of the term in the specification. In re Morris, 127 F.3d 1048, 1054, 44 USPQ2d 1023, 1028 (Fed. Cir. 1997) (the USPTO looks to the ordinary use of the claim terms taking into account definitions or other "enlightenment" contained in the written description); But c.f. In re Am. Acad. of Sci. Tech. Ctr., 367 F.3d 1359, 1369, 70 USPQ2d 1827, 1834 (Fed. Cir. 2004) ("We have cautioned against reading limitations into a claim from the preferred embodiment described in the specification, even if it is the only embodiment described, absent clear disclaimer in the specification."). When the specification sets a clear path to the claim language, the scope of the claims is more easily determined and the public notice function of the claims is best served. "Though understanding the claim language may be aided by explanations contained in the written description, it is important not to import into a claim limitations that are not part of the claim. For example, a particular embodiment appearing in the written description may not be read into a claim when the claim language is broader than the embodiment." Superguide Corp. v. DirecTV Enterprises, Inc., 358 F.3d 870, 875, 69 USPQ2d 1865, 1868 (Fed. Cir. 2004). See also Liebel-Flarsheim Co. v. Medrad Inc., 358 F.3d 898, 906, 69 USPQ2d 1801, 1807 (Fed. Cir. 2004) (discussing recent cases wherein the court expressly rejected the contention that if a patent describes only a single embodiment, the claims of the patent must be construed as being limited to that embodiment); E-Pass Techs., Inc. v. 3Com Corp., 343 F.3d 1364, 1369, 67 USPQ2d 1947, 1950 (Fed. Cir. 2003) ("Interpretation of descriptive statements in a patent’s written description is a difficult task, as an inherent tension exists as to whether a statement is a clear lexicographic definition or a description of a preferred embodiment. The problem is to interpret claims ‘in view of the specification’ without unnecessarily importing limitations from the specification into the claims. "); Altiris Inc. v. Symantec Corp., 318 F.3d 1363, 1371, 65 USPQ2d 1865, 1869-70 (Fed. Cir. 2003) (Although the specification discussed only a single embodiment, the court held that it was improper to read a specific order of steps into method claims where, as a matter of logic or grammar, the language of the method claims did not impose a specific order on the performance of the method steps, and the specification did not directly or implicitly require a particular order). See also subsection IV., below. When an element is claimed using language falling under the scope of 35 U.S.C. 112(f) or pre-AIA 35 U.S.C. 112, 6th paragraph (often broadly referred to as means- (or step-) plus- function language), the specification must be consulted to determine the structure, material, or acts corresponding to the function recited in the claim, and the claimed element is construed as limited to the corresponding structure, material, or acts described in the specification and equivalents thereof. In re Donaldson, 16 F.3d 1189, 29 USPQ2d 1845 (Fed. Cir. 1994) (see MPEP § 2181- MPEP § 2186). In Zletz, supra, the examiner and the Board had interpreted claims reading "normally solid polypropylene" and "normally solid polypropylene having a crystalline polypropylene content" as being limited to "normally solid linear high homopolymers of propylene which have a crystalline polypropylene content." The court ruled that limitations, not present in the claims, were improperly imported from the specification. See also In re Marosi, 710 F.2d 799, 802, 218 USPQ 289, 292 (Fed. Cir. 1983) ("'[C]laims are not to be read in a vacuum, and limitations therein are to be interpreted in light of the specification in giving them their ‘broadest reasonable interpretation.'" (quoting In re Okuzawa, 537 F.2d 545, 548, 190 USPQ 464, 466 (CCPA 1976)). The court looked to the specification to construe "essentially free of alkali metal" as including unavoidable levels of impurities but no more.). "[T]he ordinary and customary meaning of a claim term is the meaning that the term would have to a person of ordinary skill in the art in question at the time of the invention, i.e., as of the effective filing date of the patent application." Phillips v. AWH Corp.,415 F.3d 1303, 1313, 75 USPQ2d 1321, 1326 (Fed. Cir. 2005) (en banc); Sunrace Roots Enter. Co. v. SRAM Corp., 336 F.3d 1298, 1302, 67 USPQ2d 1438, 1441 (Fed. Cir. 2003); Brookhill-Wilk 1, LLC v. Intuitive Surgical, Inc., 334 F.3d 1294, 1298 67 USPQ2d 1132, 1136 (Fed. Cir. 2003) ("In the absence of an express intent to impart a novel meaning to the claim terms, the words are presumed to take on the ordinary and customary meanings attributed to them by those of ordinary skill in the art."). The ordinary and customary meaning of a term may be evidenced by a variety of sources, including the words of the claims themselves, the specification, drawings, and prior art. However, the best source for determining the meaning of a claim term is the specification – the greatest clarity is obtained when the specification serves as a glossary for the claim terms. See, e.g., In re Abbott Diabetes Care Inc., 696 F.3d 1142, 1149-50, 104 USPQ2d 1337, 1342-43 (Fed. Cir. 2012) (construing the term "electrochemical sensor" as "devoid of external connection cables or wires to connect to a sensor control unit" to be consistent with "the language of the claims and the specification"); In re Suitco Surface, Inc., 603 F.3d 1255, 1260-61, 94 USPQ2d 1640, 1644 (Fed. Cir. 2010) (construing the term "material for finishing the top surface of the floor" to mean "a clear, uniform layer on the top surface of a floor that is the final treatment or coating of a surface" to be consistent with "the express language of the claim and the specification"); Vitronics Corp. v. Conceptronic Inc., 90 F.3d 1576, 1583, 39 USPQ2d 1573, 1577 (Fed. Cir. 1996) (construing the term "solder reflow temperature" to mean "peak reflow temperature" of solder rather than the "liquidus temperature" of solder in order to remain consistent with the specification). It is also appropriate to look to how the claim term is used in the prior art, which includes prior art patents, published applications, trade publications, and dictionaries. Any meaning of a claim term taken from the prior art must be consistent with the use of the claim term in the specification and drawings. Moreover, when the specification is clear about the scope and content of a claim term, there is no need to turn to extrinsic evidence for claim interpretation. 3M Innovative Props. Co. v. Tredegar Corp., 725 F.3d 1315, 1326-28, 107 USPQ2d 1717, 1726-27 (Fed. Cir. 2013) (holding that "continuous microtextured skin layer over substantially the entire laminate" was clearly defined in the written description, and therefore, there was no need to turn to extrinsic evidence to construe the claim). 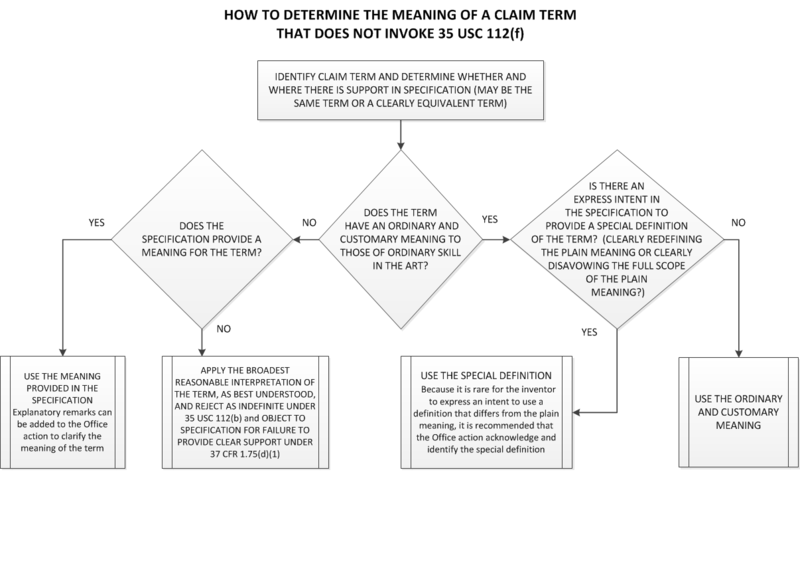 The only exceptions to giving the words in a claim their ordinary and customary meaning in the art are (1) when the applicant acts as their own lexicographer; and (2) when the applicant disavows or disclaims the full scope of a claim term in the specification. To act as their own lexicographer, the applicant must clearly set forth a special definition of a claim term in the specification that differs from the plain and ordinary meaning it would otherwise possess. The specification may also include an intentional disclaimer, or disavowal, of claim scope. In both of these cases, "the inventor’s intention, as expressed in the specification, is regarded as dispositive." Phillips v. AWH Corp., 415 F.3d 1303, 1316 (Fed. Cir. 2005) (en banc). See also Starhome GmbH v. AT&T Mobility LLC, 743 F.3d 849, 857, 109 USPQ2d 1885, 1890-91 (Fed. Cir. 2014) (holding that the term "gateway" should be given its ordinary and customary meaning of "a connection between different networks" because nothing in the specification indicated a clear intent to depart from that ordinary meaning); Thorner v. Sony Computer Entm’t Am. LLC, 669 F.3d 1362, 1367-68, 101 USPQ2d 1457, 1460 (Fed. Cir. 2012) (The asserted claims of the patent were directed to a tactile feedback system for video game controllers comprising a flexible pad with a plurality of actuators "attached to said pad." The court held that the claims were not limited to actuators attached to the external surface of the pad, even though the specification used the word "attached" when describing embodiments affixed to the external surface of the pad but the word "embedded" when describing embodiments affixed to the internal surface of the pad. The court explained that the plain and ordinary meaning of "attached" includes both external and internal attachments. Further, there is no clear and explicit statement in the specification to redefine "attached" or disavow the full scope of the term.). An applicant is entitled to be their own lexicographer and may rebut the presumption that claim terms are to be given their ordinary and customary meaning by clearly setting forth a definition of the term that is different from its ordinary and customary meaning(s) in the specification at the time of filing. See In re Paulsen, 30 F.3d 1475, 1480, 31 USPQ2d 1671, 1674 (Fed. Cir. 1994) (holding that an inventor may define specific terms used to describe invention, but must do so "with reasonable clarity, deliberateness, and precision" and, if done, must "‘set out his uncommon definition in some manner within the patent disclosure’ so as to give one of ordinary skill in the art notice of the change" in meaning) (quoting Intellicall, Inc. v. Phonometrics, Inc., 952 F.2d 1384, 1387-88, 21 USPQ2d 1383, 1386 (Fed. Cir. 1992)). Where an explicit definition is provided by the applicant for a term, that definition will control interpretation of the term as it is used in the claim. Toro Co. v. White Consolidated Industries Inc., 199 F.3d 1295, 1301, 53 USPQ2d 1065, 1069 (Fed. Cir. 1999) (meaning of words used in a claim is not construed in a "lexicographic vacuum, but in the context of the specification and drawings"). Thus, if a claim term is used in its ordinary and customary meaning throughout the specification, and the written description clearly indicates its meaning, then the term in the claim has that meaning. Old Town Canoe Co. v. Confluence Holdings Corp., 448 F.3d 1309, 1317, 78 USPQ2d 1705, 1711 (Fed. Cir. 2006) (The court held that "completion of coalescence" must be given its ordinary and customary meaning of reaching the end of coalescence. The court explained that even though coalescence could theoretically be "completed" by halting the molding process earlier, the specification clearly intended that completion of coalescence occurs only after the molding process reaches its optimum stage.). However, it is important to note that any special meaning assigned to a term "must be sufficiently clear in the specification that any departure from common usage would be so understood by a person of experience in the field of the invention." Multiform Desiccants Inc. v. Medzam Ltd., 133 F.3d 1473, 1477, 45 USPQ2d 1429, 1432 (Fed. Cir. 1998). See also Process Control Corp. v. HydReclaim Corp., 190 F.3d 1350, 1357, 52 USPQ2d 1029, 1033 (Fed. Cir. 1999) and MPEP § 2173.05(a). In some cases, the meaning of a particular claim term may be defined by implication, that is, according to the usage of the term in the context in the specification. See Phillips v. AWH Corp., 415 F.3d 1303, 1320-21, 75 USPQ2d 1321, 1332 (Fed. Cir. 2005) (en banc); Vitronics Corp. v. Conceptronic Inc., 90 F.3d 1576, 1583, 39 USPQ2d 1573, 1577 (Fed. Cir. 1996). But where the specification is ambiguous as to whether the inventor used claim terms inconsistent with their ordinary meaning, the ordinary meaning will apply. Merck & Co. v. Teva Pharms. USA, Inc., 395 F.3d 1364, 1370 (Fed. Cir. 2005) (The Federal Circuit reversed the district court’s construction of the claim term "about" as "exactly." The appellate court explained that a passage in the specification the district court relied upon for the definition of "about" was too ambiguous to redefine "about" to mean "exactly" in clear enough terms. The appellate court held that "about" should instead be given its plain and ordinary meaning of "approximately."). Applicant may also rebut the presumption of plain meaning by clearly disavowing the full scope of the claim term in the specification. Disavowal, or disclaimer of claim scope, is only considered when it is clear and unmistakable. See SciMed Life Sys., Inc. v. Advanced Cardiovascular Sys., Inc., 242 F.3d 1337, 1341, 58 USPQ2d 1059, 1063 (Fed.Cir.2001) ("Where the specification makes clear that the invention does not include a particular feature, that feature is deemed to be outside the reach of the claims of the patent, even though the language of the claims, read without reference to the specification, might be considered broad enough to encompass the feature in question. "); see also In re Am. Acad. Of Sci. Tech Ctr., 367 F.3d 1359, 1365-67 (Fed. Cir. 2004) (refusing the limit claim term "user computer" to only "single-user computers" even though "some of the language of the specification, when viewed in isolation, might lead a reader to conclude that the term... is meant to refer to a computer that serves only a single user, the specification as a whole suggests a construction that is not so narrow"). But, in some cases, disavowal of a broader claim scope may be made by implication, such as where the specification contains only disparaging remarks with respect to a feature and every embodiment in the specification excludes that feature. In re Abbott Diabetes Care Inc., 696 F.3d 1142, 1149-50, 104 USPQ2d 1337, 1342-43 (Fed. Cir. 2012) (holding that the broadest reasonable interpretation of the claim term "electrochemical sensor" does not include a sensor having "external connection cables or wires" because the specification "repeatedly, consistently, and exclusively depict[s] an electrochemical sensor without external cables or wires while simultaneously disparaging sensors with external cables or wires"). If the examiner believes that the broadest reasonable interpretation of a claim is narrower than what the words of the claim otherwise suggest as the result of implicit disavowal in the specification, then the examiner should make the interpretation clear on the record.